Hillhouse's Deshaune Poole clears a hurdle during SCC Indoor Track and Field Championship action in New Haven, Conn., on Friday Feb. 1, 2019. Poole beat a 16 year old state record by Jerome Harris of Hamden. 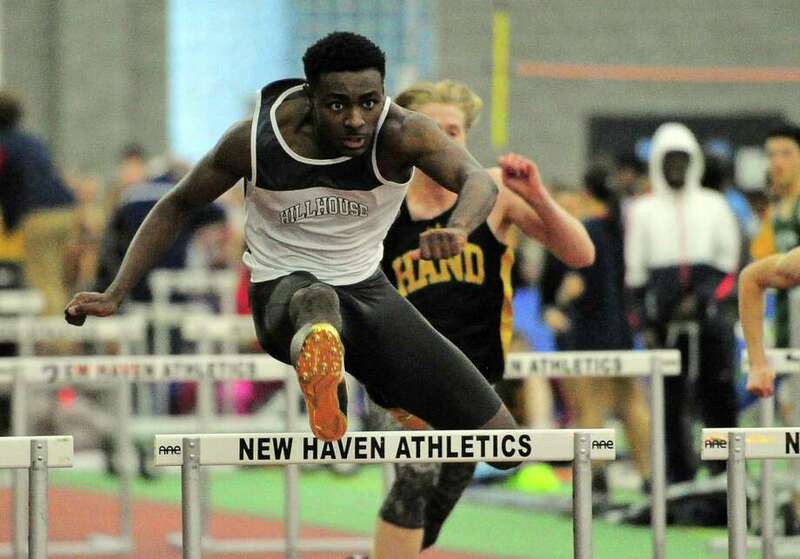 The Hillhouse senior captured the 55-meter hurdles and the 300 meters for the second consecutive year and was the anchor leg winner in the 4×400 relay in the Southern Connecticut Conference boys’ indoor track meet at the Floyd Little Athletic Center Friday night. His performance helped the Academics capture their second straight SCC title. They scored 78 points to beat Wilbur Cross, which finished second with 60 points. Xavier finished third with 49 points. Poole, who won the Most Outstanding Performer Award, set the meet record in the 55-meter hurdles with a time of 7.64 seconds, eclipsing the previous record of 7.69, set by Jerome Harris of Hamden in 2003. He had won the event last year, but finished .05 seconds short of the league record. Hillhouse coach Gary Moore was told by one of his assistants that Poole had broken the record. Neal Eley of Hillhouse also was a double winner. He won the 55-meter dash (6.56) and the long jump (22 ft. 1 ½ in.) and was second in the high jump. Teamwise, Hillhouse overcame a slow start before coming in the middle of the meet to take the lead for good. Eley realized early he was going to be needed to put a lot of points on the board. Wilbur Cross coach Travis Gale was elated with the Governors’ second place finish. 1. Hillhouse, 78 points; 2. Wilbur Cross, 60; 3. Xavier, 49; 4. Hand, 45; 5. Shelton, 38; 6. Notre Dame-West Haven, 36; 7. Amity, 35; 8. North Haven, 26; 9. Lyman Hall, 23; 10. Fairfield Prep, 21; 11. Foran, 15; 12. Branford, 13; 13. Hamden, 10; 14. Sheehan, 8; 15. Jonathan Law, 4; 16. Cheshire, 3; 17. Guilford, 1. 4×200 Meter Relay: 1. Hand (Ameen Parks, Braeden Kosiewicz, Josh Stewart, Carson Hines) 1:34.32; 2. Shelton (Jason Lorent, Michael Rodia, Martin Kovachev, Camerin Gumbs) 1:36.13; 3. Amity (Paul Johnson, Ariel Gordon, Joseph Dibenedetto, Richard Papa) 1:36.59. 4×800 Meter Relay: 1. Wilbur Cross (Eamon Hill, Nassaiah, Nassaiah Betancourt, Noah Lee, Masahito Nishimura) 8:27.01; 2. Fairfield Prep (Azaan Dawson, Edward Tristine, William Giangrande. Caleb Bolden) 8:28.10; 3. Lyman Hall (Luke Horobin, Zachary Horobin, Eric Lipka, Andrew Horobin), 8:42.33. 1000 Meter Run: 1. Mahammed Hussain, Wilbur Cross, 2:38.30; 2. Peter Schulten, Xavier, 2:39.76; 3. Robert Dillon, Shelton, 2:41.74. Boys Shot Put: 1. Kyle Maruca, North Haven, 48 ft. 1 in. ; 2. Davon Colon, Xavier, 46 ft. 1 ¼ in. ; 3. Johan Klein-Robbenhaar, Notre Dame-West Haven, 44 ft. 7 ¾ in. 600 Meter Run: 1. Pierre Sylvain, Xavier, 1:23.31; 2. Talib McBride, Hillhouse, 1:24.43; 3. Nassaiah Betancourt, Wilbur Cross, 1:25.57. 55 Meter Dash: 1. Neal Eley, Hillhouse, 6.56; 2. Michael Rodia, Shelton, 6.59; 3. Jason Lorent, Shelton, 6.63. 55 Meter Hurdles: 1. Deshaune Poole, Hillhouse, 7.64*; 2. Richard Papa, Amity; 7.85; 3. Robert Farley, North Haven, 8:10. 1600 Meter Run: 1. Travis Martin, Wilbur Cross, 4:27.33. 2. Marzio Mastroianni, Branford, 4:27.47; 3. William Curran, Xavier, 4:28.93. Long Jump: 1. Neal Eley, Hillhouse, 22 ft. 1 ½ in. ; 2. Michael Toppin, Lyman Hall, 21 ft. 3 ¼ in. ; 3. Robert McCulloch, Fairfield Prep, 20 ft. 5 in. 1600 Sprint Medley: 1. Wilbur Cross (Devin Cue, Jasiah Barnes, Elliot Faulkner, Mahammed Hussain) 3:43.96; 2. Hillhouse (To’rae Wright, Reginald Coleman, Dale Thompson, Talib McBride) 3:44.62; 3. Hand (Braeden Kosiewicz, Ryley Brohel, Carson Hines, Connor Parthasarthy) 3:48.06. 300 Meter Dash: 1. Deshaune Poole, Hillhouse, 35.45; 2. Michael Toppin, Lyman Hall, 35.66; 3. Warren Murphy, Notre Dame-West Haven, 36.23. High Jump: 1, Shaun Graham, Amity, 6 ft. 4 in. ; 2. Neal Eley, Hillhouse, 6 ft. 2 in. 3. Jason Sawicki, Notre Dame-West Haven, 6 ft.
3200 Meter Run: 1. Connor Visnic, Amity, 9:23.71; 2. Travis Martin, Wilbur Cross, 9:28.82; 3. Robbie Cozean, Xavier, 9:35.20. Pole Vault: 1. Nicholas Costantini, Foran, 14 ft.; 2. Eric Spignesi, North Haven, 12 ft.; 3. Bruce Myers, Hand, 12 ft.
4×400 Meter Relay: 1. Hillhouse (Talib McBride, Dale Thompson, Reginald Coleman, Deshaune Poole) 3:30.35. 2. Hand (Connor Parthasarthy, Corey Duncanson, Greyson McGeary, Carson Hines) 3:34.13. Notre Dame-West Haven (Daniel Range, Agir Neel, Christian Panagrossi, Warren Murphy) 3:34.40.